This page displays a knowledge base link to view and understand the working of the extension properly and get the clarifications on Houzz-Magento Integration. 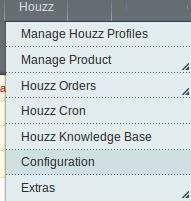 On the top navigation bar, move the cursor over the Houzz menu. How to sell on Houzz Marketplace? How to get API keys from Houzz Marketplace ? How to Define Attributes For Item Setup? How to Select The Best Category For An Item? How To Set Up A Variant Group/Products? How to Choose Current Tax Codes For The Houzz Marketplace? How to generate UPC code ?